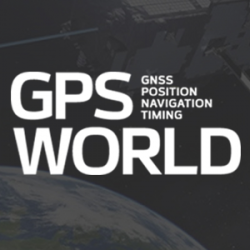 Described are the results of realistic simulations carried out to precisely position a low-Earth-orbit satellite using a source of real-time GPS corrections actually transmitted by a network of geostationary satellites. Even accounting for data outages, 3D positioning accuracies better than a decimeter have been obtained. Precision on board? Not right now but likely coming real soon. We take a look at a revolutionary design of a multi-frequency multi-GNSS antenna. Our authors discuss how the antenna evolved from a research project in academia to a commercial product about to enter the market. Enhanced Loran could furnish the wide-area complementary solution to GPS that is urgently needed for critical infrastructure components. This article highlights the state of current eLoran technology and discusses future potential. 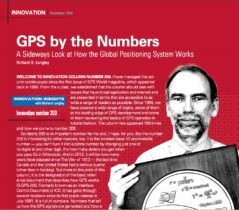 In this month’s column, we look at proposed changes to the way navigation messages are formulated that could result in a future satellite navigation system providing faster fixes effectively giving receivers higher sensitivity and stronger performance. The use of large transmission bandwidths offers a number of benefits, including accurate ranging and that application in particular is being actively developed for positioning and navigation in environments that are challenging to GNSS such as indoors and built-up areas. In this month’s column, we take a look at the work being carried out in this area by a team of researchers at The Ohio State University.